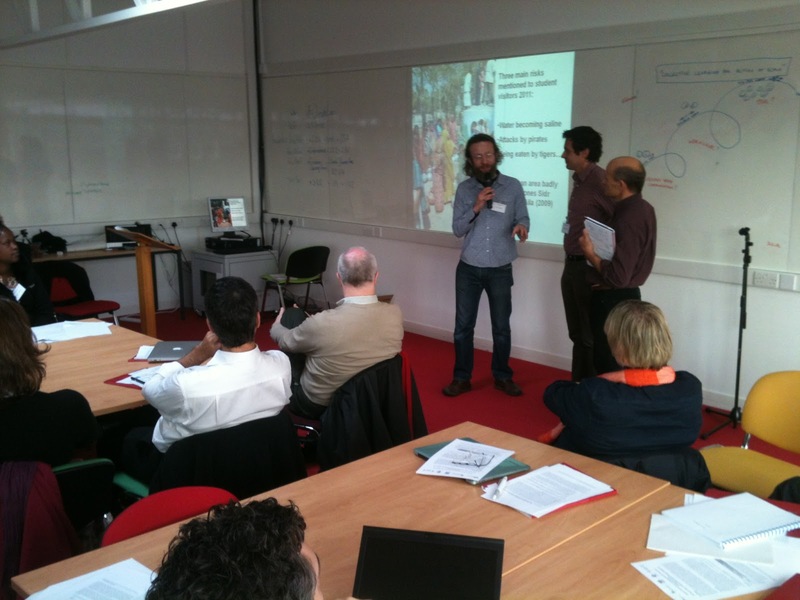 This is the second post on the Climate Change Knowledge Exchange – From Action to Learning – held at IDS in early March 2013. As laid out in the first post, Ewen Le Borgne, Carl Jackson and I co-facilitated the workshop as part of our work for the Climate Change and Social Learning (CCSL) project, a stream of work in the Climate Change for Agriculture and Food Security (CCAFS) programme. We wanted to weave the social learning approach into the IDS Knowledge Exchange, partly because we believe that it provides an interesting methodology to address the issue of how to move from learning to action and partly as part of our own social learning about Social Learning. In this post I do my own reflecting on the process and it’s outputs. For the second day we set up a process that we hoped would put people into a different, more reflective, frame of mind as they approached the third thematic break-out session. 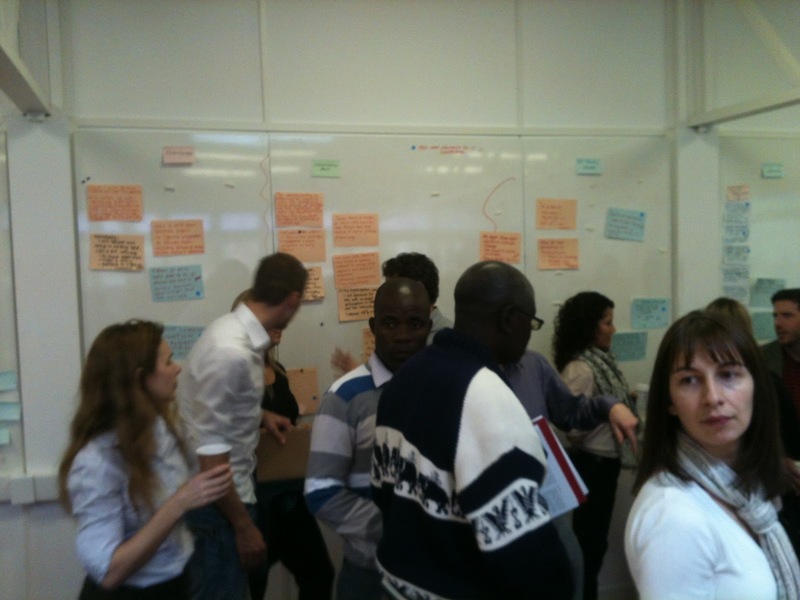 The framing for the whole day was asking people to think about what they would do differently after the workshop at four levels: personally, in their organisations, in the context of their thematic groups – i.e. with those people gathered in the room – and, possibly, more widely. After coffee the participants returned to their thematic groups. What does a third loop look and feel like? On Day One the three of us did a nonsensical but fun introduction to the idea of triple loop learning, based on the iconic British class system sketch from the 1960s, in which each of us represented a loop. Ironically, I realise I approached the planning mainly in loop one and two mode, and hadn’t reflected enough myself, hadn’t really gone into third loop mode. So I hadn’t grasped a key point about the relationship between the three loops which is that there is an exponential increase in the complexity of the process as we move from first to second to third loop. That means that the process slows, also exponentially. Thinking Fast and Slow, the tremendous book by the Nobel Prize winning Daniel Kahnemann, talks about the mental and physical energy required to do complex tasks: we can’t drive effectively, walk slower, burn more calories if we focus on difficult tasks requiring what Kahnemann calls System Two thinking. Loop three thinking occupies different parts of our thinking processes, some foreground, some background. Writing this blog is a reflective act, but it is anchoring me to current processes that reflecting on a long walk wouldn’t. So it is the product of those slower, more reflective processes. As we approached the final stages, considering what could come of the workshop, one of the participants reminded us that having no immediate outputs would be appropriate, indeed normal: that taking on board reflections that come out of a process designed to encourage deeper, non-operational, non-quotidian thinking will often take long time to surface. As an activist type I’d anticipated this kind of reaction from reflectors, but it’s hard not to feel disappointed when the actual outputs from the event seemed no different from any other event. Meanwhile, there was a lot of very positive feeling in the room, during our walking evaluation, and a many concrete proposals for future collaborations and other actions. People will be going out, ‘to do stuff’, as they were encouraged to do in the conference closing. And, with the IDS climate change team, we’re going to follow up in 3 months which will be an interesting exercise in itself: it’s rare that we follow up longer term, systematically – although it’s a common Next Step from workshops. Development people default to project mode, framing responses and concepts in terms of a planning framework, action oriented, timebound, constrained by project definition processes. Part of that is a mindset, part of it is simply the product of the constant requirements created by project plans and operational realities, that people ‘see’ in lists and planning frameworks. That’s reinforced by a typically insightful reflection from Liz Carlisle of IIED, that many busy people, especially at more senior levels, tend not to engage a lot with new ideas or people. Meetings, conferences, workshops, tend to be with people engaged in similar programmes, or networks: so being creative and innovative in workshop settings calls on relatively unfamiliar processes, and a sometime stale knowledge base. Therefore thinking about learning itself, about how change happens in a personal way requires a step sideways and out of daily life which is hard to achieve in a two day workshop. In our After Action Review Andy Newsham, the organiser, and I agreed that we needed at least a third day to match our ambitions. As someone who promotes and takes part in social reporting from events, I was brought up short by the realisation that we make that pressure worse by tweeting, blogging, wiki-ing during the event: although our social reporting outputs are to some extent reflective, commentaries, holding up a mirror to processes and interacting in a different space to the physical, by running those streams we immediately anchor ourselves in the present and engage those parts of our brains which I associate with second loop learning. This blog, on the other hand, is the product of something different, which is interesting to me at least: we often stress the importance of blogging as a learning tool, for sharing, but it is only since I started blogging regularly here and for the Diplo Foundation that I have recognised the value of structuring reflections as a communication. That’s critically important for those of us who work as consultants since we often don’t have a team with whom we reflect or an organisation with various learning and KS processes. Pier Andrea Pirani, the other Euforic Associates and I work both together and separately, but even when we work together it’s often online, so we relish the times when we meet and have time to share ideas. ‘Slow Knowledge’ and what would I do differently? Not be so linear, since triple loop thinking isn’t linear, in the sense of having to pass sequentially between each stage. Given, that and the issue of complexity, time and attention discussed above, I would start with a ‘loop three’ type exercise: get the reflection process started from the outset, and then constantly return to that process in short, intense bursts. Following a request from a couple of participants, we added in a rapid Knowledge Cafe type process on Day Two morning (pictured here), when people moved around ‘stations’ within the large plenary room, visiting and hearing about the other thematic groups outputs from the Loop One and Loop Two processes. Another participant commented, when we were in the middle of our ‘Loop Three style’ conversation that she’d found that mixing of themes the most useful because in her experience, meeting people outside her specialism is what made her think differently, challenge her assumptions. So I would ensure we built in both thematic work – making sure people have an opportunity to dive deep, develop their story – and cross-thematic work.